Premiere: December 11, 2011; at Muktangan Rangalaya (Kolkata, West Bengal, India). 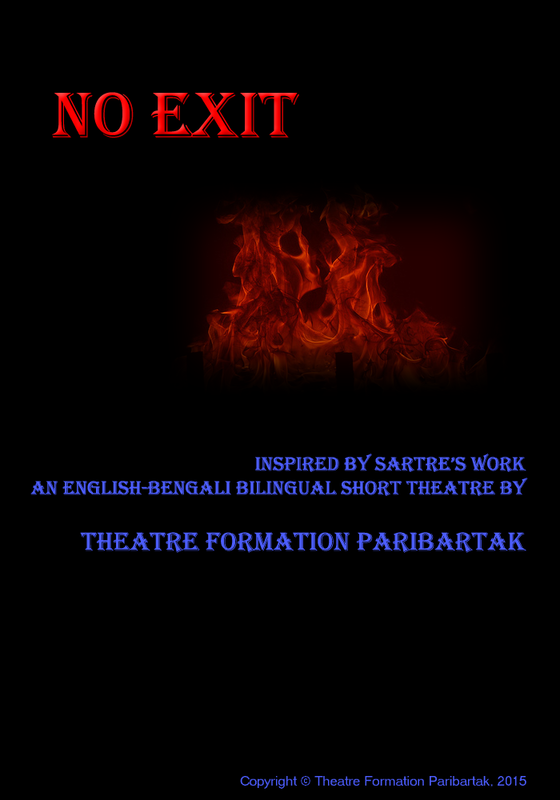 Prepared by Theatre Formation Paribartak being inspired by the play written by Jean-Paul Sartre. TFP's script is in Bengali-English bilingual. The duration of the theatre is 50 minutes. This theatre is best in Proscenium. 6. For a complete list of the shows of all the theatres of Theatre Formation Paribartak, click here. To check if there is any show of Waiting For Godot scheduled, click here. In its premiere show (at a multilingual theatre competition) in Muktangan, this theatre clinched three awards - Special Recognition Prize for Production, Best Actor (Amajit Basu as Robin) and Best Actress (Koyel Ghosh as Nina). It has not been presented again in theatre competitions. To see a complete list of awards, click here. The original play was written in French in 1944 by the Nobel-Laureate French author Jean-Paul Sartre. It was premiered in Théâtre du Vieux-Colombier in May 1944. The original play has not been translated, rather the structure of the play has been taken. The sequences, dialogues and characters have been newly created to make them fit in the curves of acceptance of the spectators in the main field of its performance. The performance of this play comes not to be of the one written by Sartre. But, what is performed cannot be called other than "No Exit".